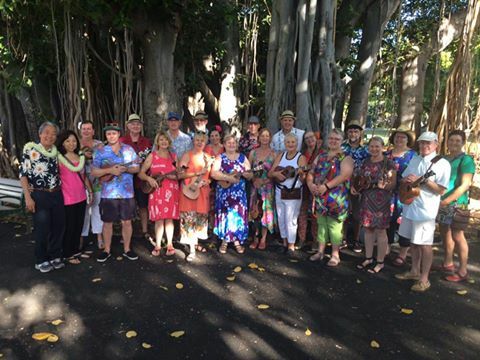 2016 was our fifth performance at the Hawai’i Ukulele Festival and our first as Ukestralia – we had 34 Ukestralians! (If you are interested in future Ukestralia appearances, like us on Facebook). Find out what we did in 2016 on this page. A collection of photos, videos and good memories. The official Festival Video of our first song – Norwegian Wood by the Beatles – sung by Charles Harmon and Kathy Wilson. Fire and the Flood – by Australian, Vance Joy. Carol McCaskie in lead vocals, Kathy Wilson again on harmonies. Thanks to Di Moore for this video footage from the audience. Di Moore from Victoria sings My Island Home – another Australian classic. These three songs were our performance songs on the main stage, limited to 10 minutes only. Later we performed for 20 minutes in the ‘lunch tent’. A relaxed gig, with a few extra songs including Buzzcut Season (Lorde) and One of These Nights (The Eagles). We enjoyed ourselves too much there to video it! From Newcastle, NSW – Lorraine Cook, John Cardwell, Marion Cardwell, Anne Heath, Marion Johnson, Robyn Bore, Kathy Wilson, Philip Wilson, John Paull, Chris Matthews, Bev Matthews, Robert Crozier, Charles Harmon, Karen Harmon, Karin Anseline, and Carol McCaskie. From Armidale, NSW – Natalie Jackson, Angie Smith and Cathy Welsford. From the North Coast of NSW – Vanessa Nugent, Ruth Allen, Sue Stenning and Julie Priest. From the Sunshine Coast, QLD – Shelley Schweikert, Ann Morris and Charmian Boulter (sadly couldn’t make it at the last minute). From Geelong and Yackandandah, Victoria – Lynda Brown and Di Moore. Thanks to Roy and Kathy Sakuma for these photos of our performance. A few people arrived a couple of days before the festival and got to play at the Honolulu Zoo, ably lead by Ruth Allen. And it’s gold! gold! gold! to Western Ukestralia! A few of us visited a uke shop in Waikiki one evening and were privileged to see Sam Lemann and Kimo Hussey perform spontaneously. This video is of a similar performance from the previous year. Sam is one of Australia’s premier uke players. Imagine how great we felt to have Sam join us in our festival and zoo performances. He is such a humble virtuoso. Speaking of virtuosos – each night we went to see the Langley Ukulele Ensemble. Mark joined them for Waltzing Matilida. We also did a great 3 hour workshop with Kimo Hussey. And finally, Mr Fong, our 92 year old host at the Royal Grove Hotel, with Leonard from the Sunset Strummers (and Kanikapila at Da Racks).